Available in a variety of colors and shapes, commercial food storage containers will keep your ingredients properly stored until they're ready to be cooked. Keep your dry bulk ingredients safe and sorted with ingredient bins, whether you need small countertop bins or large rolling containers. Because they lack sharp edges where ingredients might get stuck, round food containers are a good choice for properly storing sugar, flour, grains, and more. Find the right tools here for proofing and storing pizza dough, including pizza dough boxes and pans. These large food storage containers are constructed from a durable clear plastic to give kitchen staff an unobstructed view of the products inside. Aluminum, stainless steel, and plastic scoops in a variety of sizes and shapes are available to meet your kitchen's needs. 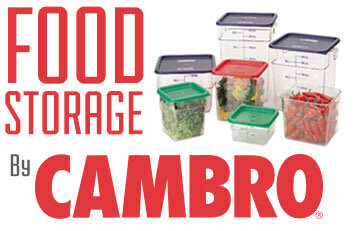 Stock up on salad bar crocks to organize and serve salad dressings, condiments, and soups for your customers to enjoy. Food storage labels will help your kitchen staff ensure the freshness of the ingredients being used and comply with local food codes. Kitchen canisters can be used behind-the-scenes to store ingredients or in your front of house for displaying and serving items at a buffet.